Gosh Darn Everyone … that was pretty mean of me to leave you all in suspense like that!! 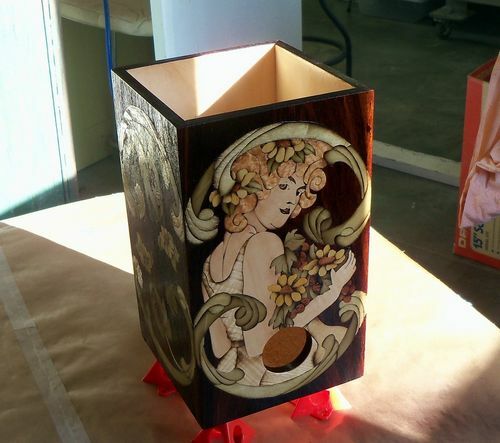 But pressing the main Art Nouveau design onto the front of the wine box turned out absolutely fine … and better yet … I found those missing photos relating to the other 3 panels!! BUT ... before I get farther into this blog I’m wondering if anyone out there has had a window jump up in front of them while on this particular site stating: ”Warning … Visiting this site may harm your computer. Contains Malware! !” ??? It’s never happened before, until this evening when I tapped in!! I knew somebody out there in LumberJock Land was interested in my presses. I’m glad you got to view my ‘pride & joy’ press Mathew! 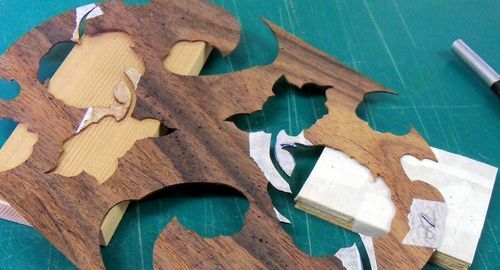 The method I use to prevent the smearing of veneer colours into other veneers … especially dark smudging into those light ones … is to apply a few coats of sanding sealer to the raw veneer surface BEFORE trying to sand anything. In fact I don’t even sand then! I use my hand-dandy straight edged razor to scrape the surface … then apply more sanding sealer. The sanding sealer left behind will help to fill some of the grain … however, at this point it’s more important to preserve the clean colours of each veneer. Another coat of sealer is sprayed onto the surface and the box set aside to dry while I apply some thought to the other 3 panels. Why not just leave that front panel alone until the rest of them have been glued on and are ready for spray finish?? Well … I tend to be a bit hard on things … and in the process of gluing 3 other panels to this box, it’s nice to know that the lacquered surface can handle a few scratches that are much easier to remove than having to remove scratches from raw surfaces! I know I wasn’t as fussy while gluing took place for those other panels. In comparison, very little time was spent in the cutting of their design. Nouveau Gal warranted that extra bit of tender lov’n care!! 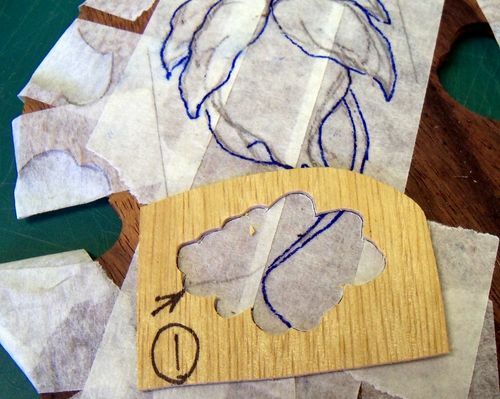 The next series of photos will show the progression of those other 3 panels … from the first showing a rough penciled idea, along with pad of Poplar veneer ready for leaf-making, the flower template I’ll use for scribing, and the grape clusters that will be inserted into the large leaf design afterwards. 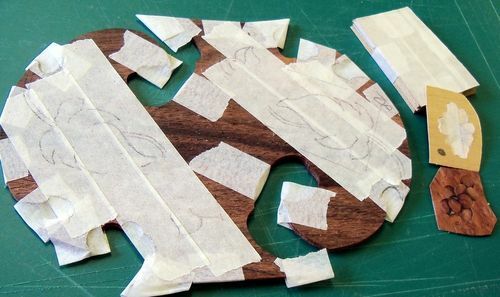 With one end of the design cut out from the Rosewood background (these 3 panels padded together minus the motif design), the top ‘waste’ section from that cut is used as a template to scribe for a close duplicate on the other end of the panel … and the scribe lines enhanced with shoe polish. I finally used up all my old hardened black polish and am happily using my soft and pasty brown stash!! ... wishing I had thrown out that black stuff a long time ago. Waste not, ya know?!! Now comes the fun stuff!! 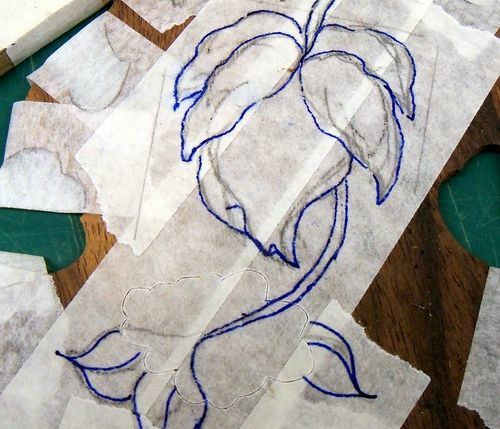 Blocking up one end while inserting the padded Poplar under the other, a leaf is scribed. By now … my faithful followers! 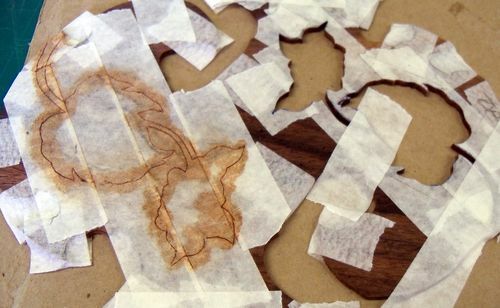 ... you are well versed in all the many facets of preparing a Marquetry design!! 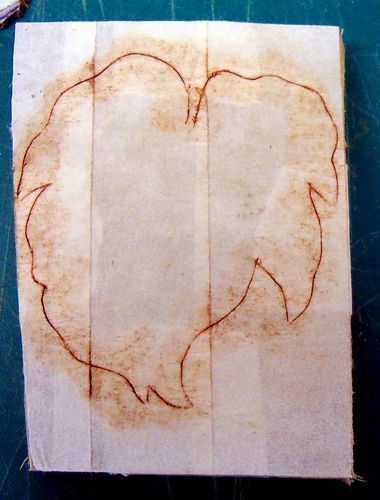 The cutting, and sand shading. The piecing together and face-taping. Filling the back, light pressure while drying. The slow but necessary process of scraping away excess filler, then refilling in spots wherever needed. ............... and surprisingly this came together very quickly! BUT ... before the filler was applied to the backs of these panels, I had to stop and seriously contemplate their succession, as the design had to be used in the reverse for a match in one panel … and another not only reversed, but upside down!! Ya … I know … that doesn’t really make sense! So I’m not giving much thought as to the why of it. That the motifs had to match up at the end of the day was my only concern!! At long last, the prepared 3 panels were glued to their substrate box!! Edges were trimmed and sanding sealer applied, and scraped off a few times. Not a bad match … eh?!! With a few more coats of sanding sealer … a few more sessions with the razor blade … and a final coat of sealer (just for good measure!) ... Nouveau Gal with her ‘entourage’ of motifs, grapes and flowers was set aside to rest! Rest? ... that sounds like a really good idea!! The last blog for Nouveau Gal will concentrate of the construction of her lid. Yes, you heard me right! 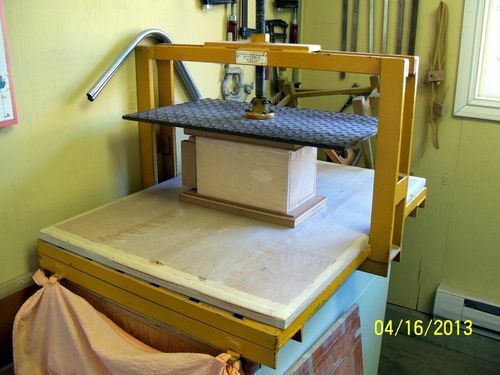 I am going to build this lid with my very own hands!! Okay … I can afford to be a teensy-weensy bit boastful at this point because it’s actually in the final stages of completion … mitered corners and all!! But if that isn’t enough enticement for you to tap in next time … maybe the thought of viewing a special visitor I bet you’ll all recognize will make you curious enough, eh?!! You are all such a fun bunch of artistic people who know how to shower this gal with encouragement and wonderful praise … do you think I’m about to give that up?!! Elaine, she is absolutely gorgeous. I enjoyed the journey and seeing her come together and look forward to the next instalment. 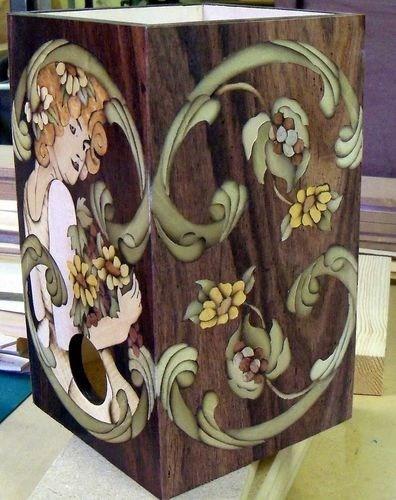 On a trip to Italy a few years ago while in the Sorrento area I marvelled at the local craftsman who made marquetry boxes. I’m not sure that they would be okay with “wine in a box” but your work is every bit a good as that of those Italian masters. Milk in bags, wine in boxes is that a Canadian thing? Very interesting. You do beautiful work. Your box is stunning! i marvel at this work, it is so detailed. About your malware popup, that particular one is an ad for a service that provides protection. 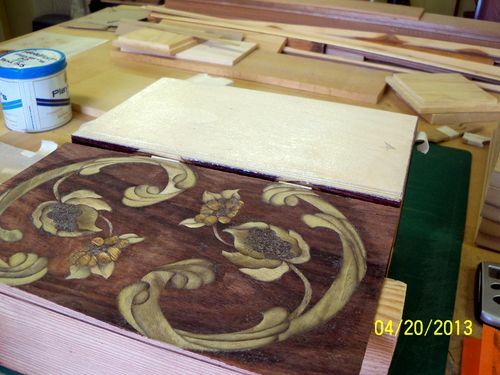 Beautiful Marquetry!!! I really like your design and Technique. Just in case anyone was wondering … Yes all the other corners match that well too. The photos are great but this box in person is even more impressive. This is a wonderful example of your style and your talent. Your blogging style is just so engaging Elaine. You fully deserve the band of “faithful followers” that you have attracted. Enjoy cottage country and keep blogging when you can. 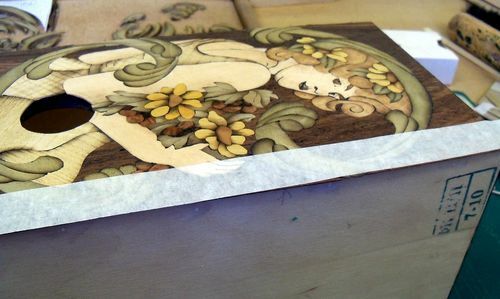 Well it is a relief to get my marquetry fix just in time after a hard day in the garden! This is awe inspiring work Elaine. 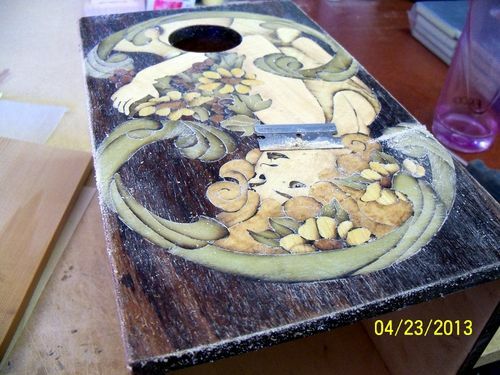 I was glad to hear about how you use the sanding sealer to protect from color transfer. 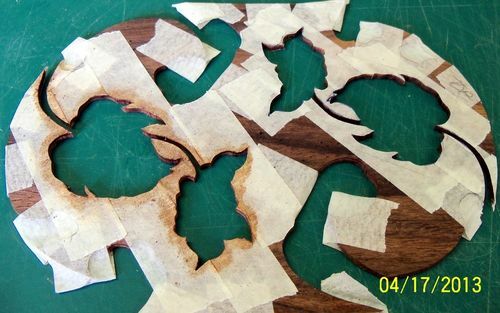 I plan to do that with shellac. 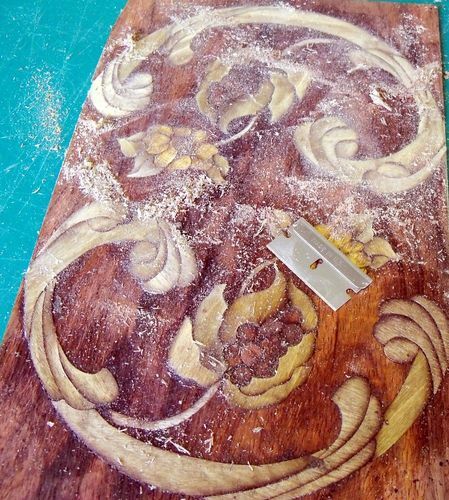 Wouldn’t it be easier on your poor fingers to do the scraping with a scraping plane? If you are not familiar with that, please ask Paul about it. I’m having empathy pains just looking at that little razor blade. 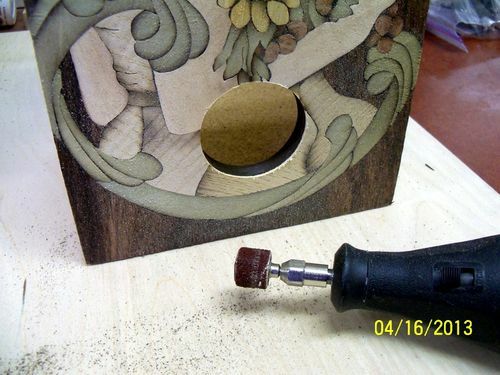 I am wondering how you handle the veneer on the miter corners. Is the veneer mitered too, or is it too thin for that? Looking at the box in that slyly bad photo made me think that the Nouveau Gal is looking at us and saying “can you top this?” which is exactly what you will be doing for the grand finale and I hope a much better photo of the completed artwork. I really want to see that Rosewood background too! BTW we drink box wine here too, (and any other container we can get it in), and some of it isn’t all that bad. We like the California wines best. Looking forward to your next installment! That sure do look pretty, nice to see it all come together. This is stunning Elaine! You have a great way of writing and making the process interesting and entertaining. I’ll miss your blog when you are enjoying your cabin. I always seem to come late to the party, but what a party it is! Your work is absolutely incredible! I knew it would be gorgeous with all the fine details, but seeing it nearly completed is icing on the cake. It seems that you finished the other three sides in no time at all. What a wonderful journey you have allowed us to enjoy with you. Many thanks everyone … my devoted followers!! this project will soon come to an end, and I will certainly miss all these wonderful comments that have been so filled with encouragement and support. Being put up on the pedestal alongside Italian masters is indeed high praise … thank you Peter!! You hit the nail on the head Grizzman ... when it comes right down to it, we can take pride in accomplishments, but the journey is the always the best part! ... especially when accompanied with such accolades!! Sometimes it can be said that photos ‘don’t do it justice’ ... but sometimes photos can enhance an otherwise less than quality subject. Perfection is always strived for but I don’t think ever attained (close but not perfect!) ... that’s what keeps us all human!! However, it’s always wonderful Paul to see the real thing, and be impressed with the visual enough to critique objectively and share ideas … and having that kind of like-minded relationship has been perfect! In fact getting to know my various buddies through Lumberjocks and sharing ideas has been perfect!! In answer to your question Mike ... A freshly dried lacquer surface is extremely easy to scrape down with that little razor. 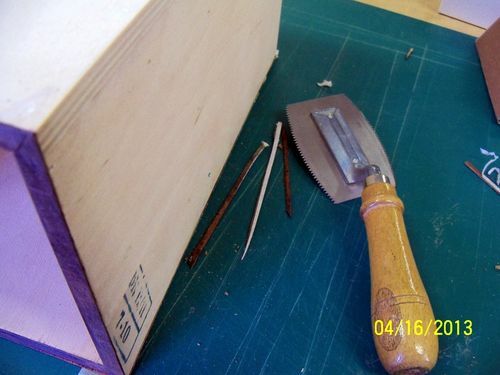 At one time I did have scraping planes you bend by pushing your thumbs into the middle while scraping … not sure if those are what you were talking about … very hard on the thumbs! !, but also too much to handle with fresh lacquer. 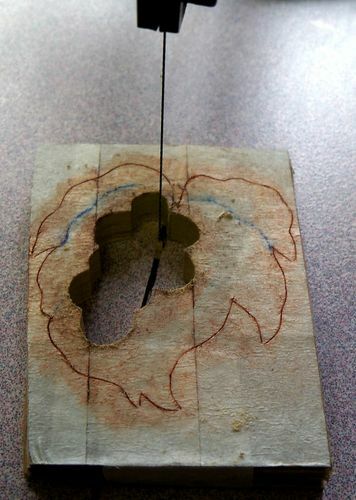 And the other question about the veneers being mitered on the corners of the box … If the design had been glued to a thin substrate first before being glued to the box, then I would have had to miter the edges to prevent the thin substrate from showing. Just veneered straight to the box, and sanded to round over the edges slightly … they blend in well. That’s it for now … Hope you all enjoy the last blog on Nouveau Gal!! Jumbojack ... many thanks for the ‘window’ tip. Next time it happens to pop up I won’t panic!! L/W ... fashionably late is good!! Those other three panels did get put together quickly, not having much ‘fussiness’ about them. That’s also a good thing!